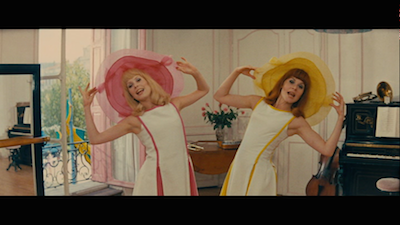 Jacques Demy’s take on the big American musical, 1967’s The Young Girls of Rochefort, is pure joy. From the first frame to the last, it’s packed with smiles and passion and a giddy sense of its own fun. 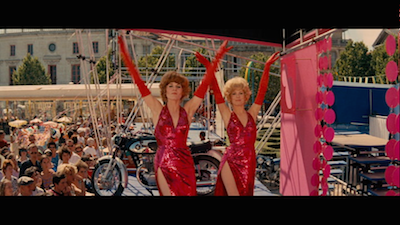 Set in a seaside town on a carnival weekend, The Young Girls of Rochefort puts aside the operatic stylings of The Umbrellas of Cherbourg [review] in favor of something more akin to Stanley Donen, director of Singin' in the Rain and Funny Face [review]. In case there was any doubt, Demy even imports Gene Kelly, Donen’s former partner and one of the most accomplished hoofers in Hollywood, to participate in this ambitious lark. 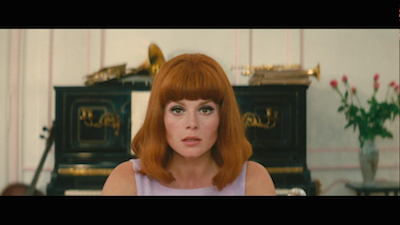 Real-life sisters Catherine Deneuve and Françoise Dorléac play Delphine and Solange, twins with big dreams. Delphine is a dancer, Solange a composer, and the two get by teaching the children of Rochefort their craft. The pair are planning to move to Paris, however, as soon as the celebrations are over. Solange already has a line on a possible job. 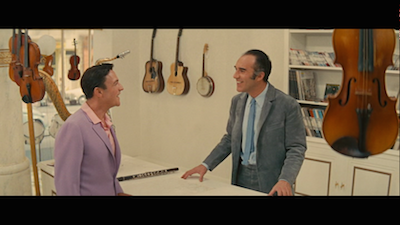 The man who runs the local music store, Simon Dame (Michel Piccoli, Belle de jour [review]), has promised to arrange for an introduction to Andy Miller (Kelly), a famous American pianist whom Monsieur Dame went to school with. Little does Dame know that Miller is in town, and the foreigner has already run into Solange without realizing it. Andy and Solange are instantly struck by Cupid’s arrow, only to be separated, unsure if they’ll ever meet again. Just about everyone in The Young Girls of Rochefort has a romantic double out there waiting for him or her to find. Dame imagines that Solange is his, but only because he doesn’t realize that the lover who jilted him a decade before, and whom he still pines for today, is her mother. Dame thinks Yvonne (Danielle Darrieux, Mayerling [review], The Earrings of Madame De.... [review]) is in Mexico and has no idea she is running a café nearby. Meanwhile, a pair of carnies (George Charkiris and Grover Dale) appeal to the sisters to perform the sideshow for their traveling motorcycle dealership (yeah, I don’t know either) because their exotic dancers have skipped off with some sailors. And then there is also a little bit of business about...a sadistic killer who hacked up an old chorus dancer named Lola?! If it sounds like a lot of plot, that’s because it is. But Demy choreographs all of these relationships with the same precision as he does the big dance numbers. 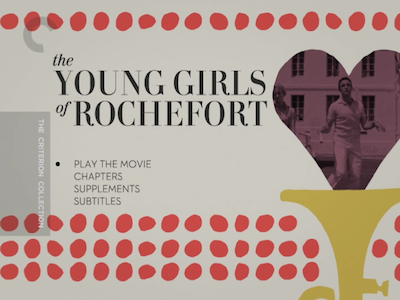 In terms of story, The Young Girls of Rochefort is about how love is fated, and so it relies on coincidence and chance opportunities. Turn one corner, meet the man of your dreams; turn the other, miss him forever. For much of the movie, many of the characters go without ever meeting one another, and they are both deaf and blind to the stray mentions or cursory sights that would actually bring them to the one they seek. One character sees the painting of Delphine’s doppelganger but then can’t remember where he saw her face when he meets her for real; Dame hears Andy playing Solange’s music, but he can’t quite place the melody. Only the bad guy who would have Delphine for his own makes the right connection. It seems blind optimism causes literal blindness. Not that we’re ever all that worried that true love won’t find anyone in the end. Even so, it’s pretty amazing watching Demy arrange the players for the final scenes, contriving for paths to cross and throwing in a few more near misses just to keep us guessing a little. The carnies and their jive have given us a little bit of that old “we’re going to put on a show!” hucksterism, and now that the sisters have had a taste of success, it’s time for their dreams to come true. Demy even outfits Deneuve and Dorléac in spangly red dresses reminiscent of Jane Russell and Marilyn Monroe’s showgirl outfits in Gentlemen Prefer Blondes . Michel Legrand also pulls out his biggest show stopper for the scene. The other numbers are catchy but more notable for the composer’s swirling rhythms and melodic filigrees; in this one, he goes big. Amusingly, it’s one of the less complicated performances in terms of dancing. 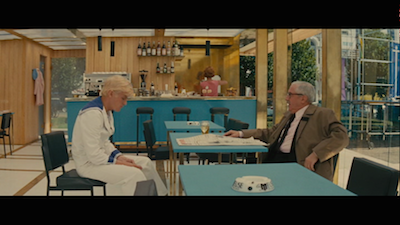 Deneuve and Dorléac are confined to a small space, and though they work it with panache, their moves are geared more to the stage than the screen. Demy’s most complicated dance material is reserved for the street scenes, where tourists and shoppers move in unison around the different characters, serving as the chorus to their romantic travails. It’s all quite impressive. Demy isn’t messing around. And neither is Gene Kelly. His level of talent and expertise is evident every time he joins in the fun. His every tiny gesture is graceful, and Andy’s ubiquitous grin seems less a character choice and more the performer being tickled by being part of this grand foreign production. (It must have seemed simultaneously ambitious and naïve to the cinema veteran.) The best dance sequence in the entire film is another twofer, when Andy and Solange are reunited. The dancers are transfixed on one another, making love with each step; Françoise Dorléac is quite literally swept off her feet. The Young Girls of Rochefort has some of the same candy-coated pastels as The Umbrellas of Cherbourg, particularly in the colorful dresses worn by Deneuve and Dorléac, and in the matching outfits you can spot on the various couples sashaying up and down the sidewalks. Demy has kept his art department intact for both films. Jacqueline Moreau is in charge of costumes, and Bernard Evein is the production designer. 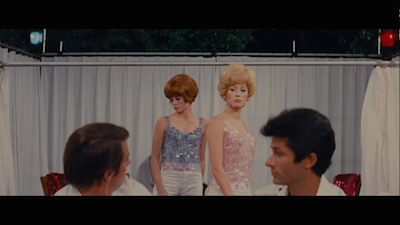 They are as essential to the Jacques Demy magic as the man himself. Likewise, Jean Rabier returns for his third time as Demy’s cinematographer. Though, Rochefort is a long way away from the Bay of Angels [review]. The sum total of all of these people working together is a substantially breezy entertainment that, despite basically coming at the end of the era of classic movie musicals, recalls the best of them. This is really Demy at his peak, the bliss of The Young Girls of Rochefort making a nice complement to the melancholy of The Umbrellas of Cherbourg. It’s these two movies that have cemented his legacy, and the ones that most often get revisited. All it takes is that initial spin of Rochefort to understand why: it’s impossible not to feel better after having watched it. By the way, I reviewed The Young Girls of Rochefort once before in my write-up of a Catherine Deneuve festival for the Portland Mercury. You can read that here. While you're at it, I looked at five of the actress' lesser films that were released as a DVD set back in 2008. Stanley Donen was the co-director of "Singin' In The Rain", the other director was Gene Kelly who also starred and choreographed the masterpiece.